LA Splash is designed for Cheerleaders- so although safe and gentle on the skin it is long lasting and won't easily sweat off! Cosmetic grade Glitters are made of soft polyester with soft edges, unlike Craft Glitter that is made from metal or glass with sharp edges that can scratch and damage the eye. For the safety of the people you paint always use cosmetic grade glitter on the face. Holgraphic Glitters are transparent, clearly reflecting the underlying Face Paint or Makeup colours, while sparkling with many similar colours. Suitable for Face Painting, Body Art, Glamour & Dance. Laser Glitters are also transparent, clearly reflecting the underlying Face Paint or Makeup colours, while sparkling with more similar shades of the colour. Suitable for Face Painting, Body Art, Glamour & Dance. Crystaline Glitters are semi-opaque with a beautiful strong, sparkley shine. Suitable for Face Painting, Body Art, Glamour & Dance and Glitter Tattoos. All other Glitters are opaque with a beautiful strong, sparkley shine and fabulous colours. 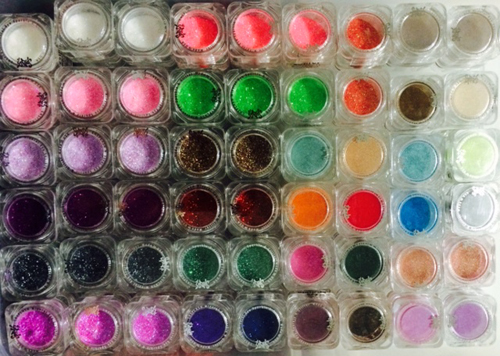 Suitable for Face Painting, Body Art, Glamour & Dance , Glitter Tattoos and Glitter Gels. All Glitter Gels can be made to order in any colour choice.